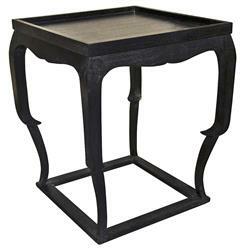 The Karima side table manages an enchanting mix of contemporary and Chinoiserie aesthetic. Sumptuous and sensible, the curved apron and stylized cabriole legs catch the eye while the simple square tray top with a raised edge offers a practical surface. Add to that an interesting negative space below the table to frame for your favorite Asian spice jar and this is definitely the Global Bazaar piece you’ve been looking for.